Compare Roomba i7 and i7+ with Roomba 890: What Are the Main Differences? Roomba vacuuming robots were first introduced by iRobot in 2002, and a number of improved versions have been released since. Top models, Roomba i7+ and i7, come with advanced features such as the ability to resume automatically the cleaning job after the robot recharges itself until the job is completed, and the ability to select the rooms to be cleaned by simply calling them by their name. 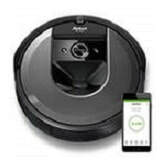 ​Roomba 890 may not have all the features that come with Roomba i7+ and i7, but it still comes with most of the important features, such as poweful vacuum, auto-recharge, Wi-Fi support, scheduling, high efficiency filters and navigation control. We will compare in this article the features of the above mentioned three robots, so you may choose the one that will best suit your home's cleaning needs. This article will first compare the Roomba i7+, i7 and 890 robots. The following table compares the iRobot Roomba i7+, i7 and 890 vacuuming robots. Roomba 890 was designed with the iAdapt navigation technology composed of sophisticated software and sensors that allow the robot to clean more thoroughly the room, making multiple passes, avoiding stairs, getting under and around furniture, and cleaning along wall edges and corners. The low-profile design of the robot allows cleaning under most furniture. It also automatically adjusts to all floor types - carpet, tile, hardwood, laminate and more. 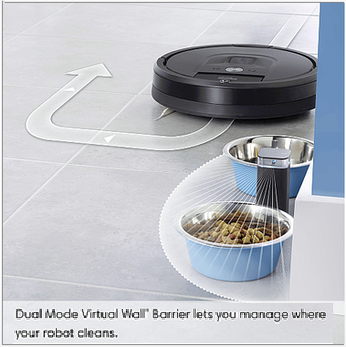 Finally, note that these Roomba robots use Dual Mode Virtual Wall Barriers to be kept away from rooms or areas they are not supposed to enter. Please see Note 16 below for more detailed explanation of these stand-alone little navigation direction control devices. Roomba 890 uses dual multi surface debris extractors which are non-bristle brushes that are tangle free. So, it is quite efficient in picking up pet hair and debris. i7 and i7+ use dual multi-surface rubber brushes that are similar to the debris extractors but that were further improved for better pickup. ​Note also that in Roomba i7+ and i7, when in Carpet Boost mode, the suction power is increased 5 times when compared to the suction power in the previous 800 series Roomba robots and 10 times when compared to the suction power in the 600 series Roomba robots. 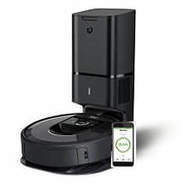 When Roomba i7+, i7 and 890 are connected via Wi-Fi to your smartphone or tablet, you can use the iRobot Home App for Android and iOS to invoke remotely operations (such as cleaning, scheduling, etc.) from wherever you are, using your smartphone or tablet. When the App is used, you can also see the status of cleaning jobs, and you can customize your cleaning preferences (such as setting the number of cleaning passes, choosing special edge cleaning action, etc.). Note: You may be asking the question: Can we use these three Roomba robots without WiFi?". The answer is "Yes! ", you can use them, but if you don't have WiFi, you will have to control them by using the control buttons on the robot or by purchasing a compatible remote-control device (see the Amazon products section below for compatible remote-control devices). Note however that certain operations on Roomba i7+ and i7 are only available from the App on the smartphone which needs Wi-Fi. Wi‐Fi connected Roomba vacuuming robots, Roomba i7+, i7 and 890, are all compatible with Amazon Alexa and the Google Assistant, so they are voice controllable. Simply ask Alexa or the Google Assistant to start, stop, or dock your robot​. The AeroForce High Efficiency filters on Roomba 890, i7 and i7+ do a great job capturing hair, pet fur, lint and carpet fuzz, and can capture 99% of allergens, pollen, and particles as small as 10 microns. The navigation direction of these three Roomba robots considered here can be controlled by Dual Mode Virtual Wall Barriers which are battery run standalone little devices that can be used to block off an open doorway, but they can also be used as Virtual Wall Halos to protect some restricted area within the room, like for instance the area where the dog food might be. All three Roomba robots considered here come with one Dual Mode Virtual Wall Barrier. Roomba i7+, i7 and 890 can be remotely controlled from your smartphone or tablet using the iRobot Home App. No explicit remote-control device is provided. However, they are also compatible with Roomba remote control devices that can be purchased separatey if desired (see below). Roomba robots can use Lithium-Ion or Nickel Metal Hydride (Ni-MH) batteries. Roomba i7+, i7 and 890 come with a Lithium-Ion battery. ​​So which Roomba is best for your home? 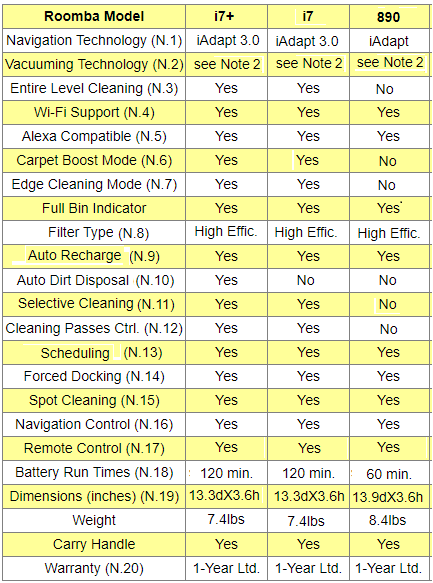 ​As the above comparison table shows, the three Roomba robots considered here come with all the must-have features that a good vacuuming robot should have, such as as poweful suction, auto-recharge, Wi-Fi support, scheduling, spot cleaning, high efficiency filters and navigation control. However, Roomba i7+ and i7 come also with some additional advanced features as shown in the comparison table above. These additional features may be quite useful in some larger homes, but for the average home Roomba 890 would be more than adequate, and as shown by the good reviews written by Amazon customers, not only will you be quite happy with it, but you will also be saving quite a bit of money.